Buddhist remains datable to the 1st century BC were identified on the top of a hill at Vaikunthapuram, a village in the new capital region. 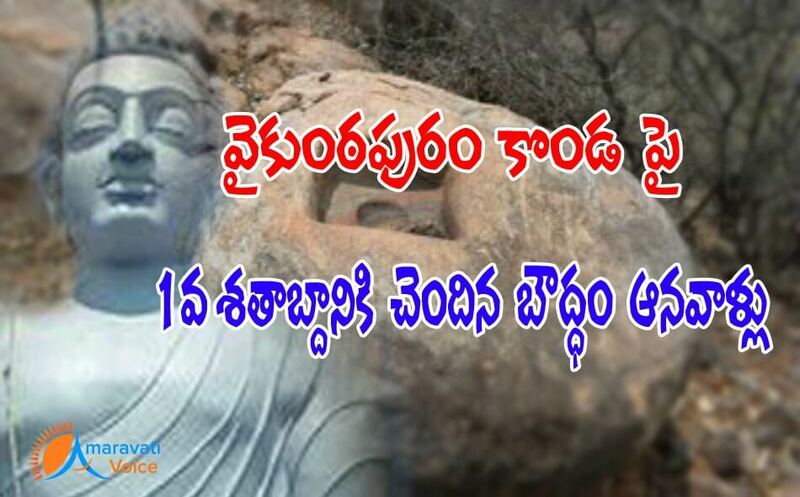 In an archaeological excavation held by Dr. E. Sivanagi Reddy, CEO, Cultural Centre of Vijayawada and a Buddhist archaeologist, the Buddhist relics were unearthed. Based on a clue given by the local people that there were some bricks and remains of pots, Dr. E. Sivanagi Reddy took up the excavation. He said he examined the two Siva Lingas that surfaced on the bed of river Krishna after the water receded. The Lingas, he said, were datable to the 5th century AD (Vishnukundin times), based on the Stylistic Grounds. Dr. E. Sivanagi Reddy, assisted by the villagers including Bhogineni Nageswara Rao, Subhakar Medasani and Chaitanya Ravela, continued their search atop the hill of Vaikunthapuram and found three mounds of bricks and red-coloured pottery. Upon these mounds, stupas were raised. The bricks used in the construction of stupas and viharas measure 60X30X8 cm and 58x28x7 cm, belonging to the Satavahana period i.e., 1st century BC, he stated. There are terracotta and brick tiles in huge quantities, of course broken, used to cover the chaityas and viharas, Dr. Reddy said. The excavations also revealed that the Buddhist monks depended on two tanks, spread in half an acre, and two rock cut cisterns for drinking water At the centre of the Stupa, a few years ago, treasure hunters dug up and found a relic casket with a gold leaf which was handed over to the Guntur district collectorate, said Subhakar and Chaitanya. The hill at Vaikuntapuram which has the remains of Buddhist stupas, chaityas, and viharas survived from 1st century BC to the 5th century AD and was occupied by Saivites during the Vishnukundin times and by the Vaishnavites in between 13th-17th centuries AD as there are temples of Venkateswara, one at the foot of the hill and another on the hilltop, according to Dr. Reddy. Found one 'Siva Lingam' on the hill top of Sithanagaram, during 1969/1970. Serpent grove around the Siva Lingam was very curious. Please pass on this information to Sri Emani Siva Nagireddy, historian of the Vijayawada cultural centre. I shall give further details if contacted me. We must preserve our anicient traceses regarding our culture.